~Pastor Lemuel Manuop (adopted ministers) God is good all the time. 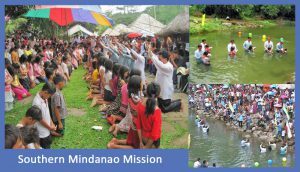 In spite of the financial problems of the Adopt a Minister Program, our work continues and many souls are accepting Jesus through baptism The adopted ministers of Davao Mission did the groundwork for the Amazing Facts Crusade here in Digos City given by Atty. Dave Steward from California, who once was a prosecutor turned preacher after having found that he has no happiness in convicting sinners to prison. There were 3 series of baptisms during the crusade and 134 souls were baptized. Many of these were my Bible students. The crusade lasted for 3 weeks and then followed by a revival meeting done by Pastor Randy Skeete, another very powerful speaker. We earnestly pray that God would show His miracles this time and send funds to support the adopted ministers. Trials are God’s ways to strengthen our faith in Him. My family has been praying night and day, pleading to God to pour His countless blessings today, tomorrow and forever. God bless everyone. Amazing Facts Crusade held on June 3 – 9, 2011 at Peñaplata Gym, Island Garden City of Samal Davao del Norte, Philippines. The speaker of this nightly event was Michael Hargreaves, the son of Pastor Lowell Hargreaves from Amazing Facts. I was one of the translators of this big event. 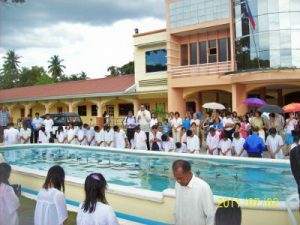 We were thankful to God and we thank you so much for your prayer because last July 9, 2011 148 precious souls were baptized and 39 of the precious souls were our Bible students. ~By Pastor Glenn Villasente (adopted minister) – We had just finish assisting the evangelistic crusade here in Kidapawan with our speaker Pastor Abner Roque, the former president of North Philippine Union Conference. Fourteen adopted ministers, my wife and I assisted this crusade for two months , including ground work. 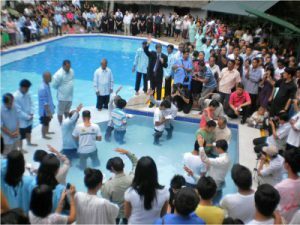 Praise God, 222 precious souls accepted Jesus as personal Saviour through baptism last October 01, 2011. ~By Pastor Dennis Alipo-on (adopted minister) – Chelmer Cacal and I were partners in our ministry here in Kidapawan. During our ministry in jail, we had 40 souls baptized and two souls reclaimed. 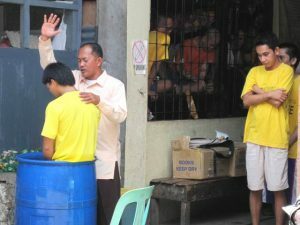 Pastor Joy Rosa organized our new members in jail and the nearby churches will nurture them. Every Sabbath one church will go and worship with them in jail.